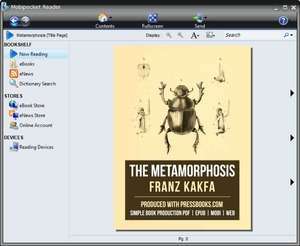 Mobipocket Reader is an eBook reader, manager and downloader that supports all types of electronic books including those downloaded from the web. Store all your eBooks, eNews & self-published eDocs on your PC. Download eBooks in Mobi format from your favourite ebookstores to read on your smartphone, PDA, laptop or on your desktop PC. Add your own published content and documents as well. Version 6.2.614 is a freeware program which does not have restrictions and it's free so it doesn't cost anything. For security reasons, you should also check out the Mobipocket Reader download at LO4D.com which includes virus and malware tests. Additional screenshots of this application download may be available, too.